One of the scoring systems for predicting bankruptcy of a manufacturing company, Z-Score has not only survived for 50 years but has been thriving. On the Bloomberg terminals there are around 10,000 daily visits! So, what makes this model so popular? In Dr. Edward I. Altman’s words firstly, it is simple to explain. Secondly, it is still accurate in predicting bankruptcy and defaults fairly in advance. Thirdly, it is available for free. No royalties from market participants or other users! Z-Score measures ratios like liquidity, solvency, profitability, capitalization and viability of non-finance / manufacturing companies and combines them to give the overall number. Depending on where this total is the companies are categorized into “Safe”, “Grey” and “Distress” zones. Kindly, refer to the equation below. Companies with Z scores greater than 2.99 are in “Safe” zone, Score between 1.8 and 2.99 in “Grey” zone and those below 1.8 in “Distress” zone. In the initial stages, Altman Z-score was found to be 72% accurate in predicting bankruptcy two years preceding the event including Type 2 errors (classifying the company as bankrupt even when it’s not going to be in future) of 6%. However, the professor modestly says that the model may not be as relevant today as it was earlier. This is on account of credit risk migration, increase in Type 2 errors, greater use of leverage, impact of high yield bonds, global competition, more and larger bankruptcies, near extinction of AAA firms. During 2016 there were only two AAA rated firms in the US, and they were Microsoft and Johnson & Johnson. Some variants of this model were created later like the one for private firms and another for the non-finance industrial firms in Emerging Markets (called Z-Score Prime in 1995 for Latin America and 2010 for China). However, little published research is available for countries like India. Likewise, we still lack proper models for predicting probability of default or loss on debt of banking & finance companies or those of sovereigns. Both the Z-Score and the bond equivalent ratings of the companies keep changing over the period. What was surprising is that the ratings provided by the rating agencies were higher than could have been provided by the simple Z-Scores. Take the example of GM’s (General Motors) paper during global financial crisis during 2008. Its bonds were rated “B-“ two years before its default rating even when its Z-Score was below 1.8 or in the “distress zone”. Though the company emerged stronger through bankruptcy process and had maintained rating of “B” between 2010 and 2014 its Z-score had been below 1.80. The high yield market has grown to $1.67trillion (tn) in the US and $2.8tn globally. Of this 15-20% of the bond are newly issued CCC bonds, which are very close to default, yet the market is thriving. This has been possible as investors are compensated for assuming higher risks. Hence there is a trade-off between default rates and recovery rates. Depending on the stage of the economic cycle, the recovery rates can vary from 40 cents on a dollar to 25 cents. On an average 20 companies with size of $1bn and above file for bankruptcy protection in the US. In good times (from bankruptcy professional’s point of view) 70-80 companies file for the same. So, is the benign credit cycle over? Based on default rates, default forecasts, recovery rates, yields, YTM & OAS spreads between high yield markets and treasury notes, liquidity, length of credit cycle, Dr. Altman says “No”. What worries him though is surge in the size of debt both in absolute terms and as a percent of GDP and across sectors like non-financial corporations, government and households. Besides these the other big risk is politics on global trades. 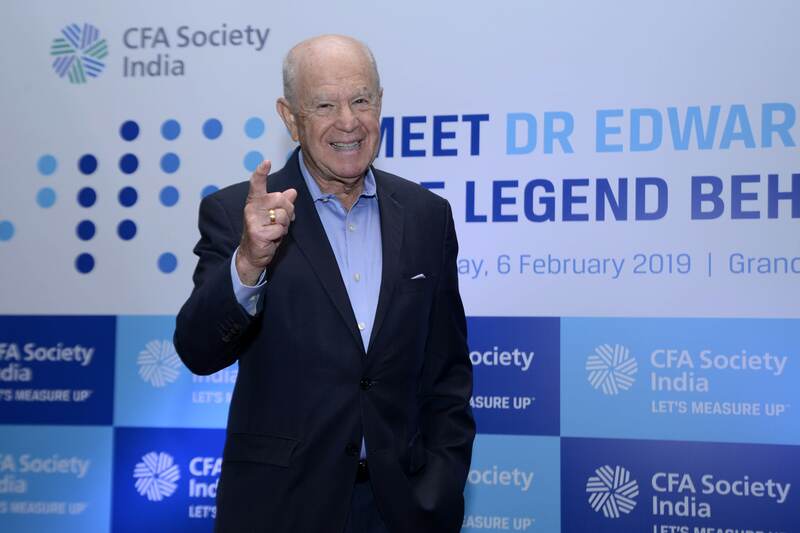 This entry was posted in Events, Mumbai, Speaker Events and tagged @CFASocietyIndia, Altman Z-score, Anil Ghelani CFA, Bankruptcy, CCC bonds, CFA Institute, CFA Institute India, CFA Society India, Chetan Shah CFA, Default, Dr. Edward I. Altman, General Motors, High Yield Bonds, IAIP, Indian Association of Investment Professionals, Kishor Bagri CFA, Recovery, Saurav Mishra CFA, US high yield bonds, Z-Score. Bookmark the permalink.